The March 1964 issue of Car and Driver featured a very promising cover. Artist Tom Quinn's watercolor featured a Ferrari GTO leading a Pontiac GTO and both appeared to be on a road course, driven all out. Anyone expecting a direct head-to-head performance comparison between the two cars was disappointed. 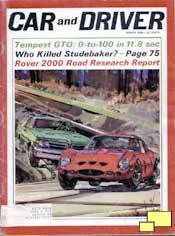 Inside was an extensive article on the Pontiac Tempest GTO and an apology. They tried mightily to arrange for a Ferrari, contacting "all the GTO owners in this country and simply could not get one of those lucky gentlemen and the weather to cooperate simultaneously. 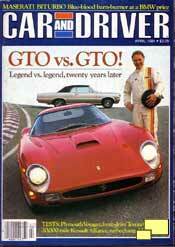 As a result, we drove two Ferrari GTO's, but we were never able actually to run the Tempest against one of them". They did feel free to offer an opinion: "the Pontiac will beat the Ferrari in a drag race, and the Ferrari will go around any American road circuit faster than the stock GTO". They also said that "our test car, with stock suspension, metallic brakes and as-tested 348 bhp engine will lap any U.S. road course faster than any Ferrari street machine, including the 400 Superamerica". The subtitle contained a small dig: "Ferrari never built enough GTOs to earn the name anyway-just to be on the safe side though, Pontiac built a faster one". They did warn their readers however, that only a carefully optioned Pontiac GTO qualified for the praise. The article was overwhealming in its praise for the Pontiac, and contained the tough in-yer-face writing style that car enthusiasts love and which has made Car and Driver the great magazine that it is. Keep in mind that the Pontiac GTO was the start of a long list of affordable performance cars; in 1964 if you wanted to go fast on a low budget you did not have a vast array of options. The handling was lauded, as was the Hurst shifter, styling and value; they pointed out that the best optioned GTO was available for under $3,800. Today, just the taxes for a performance car can easily be more. Criticized items include the tachometer and seats. The handling praise was reserved for GTOs equipped with the $26.82 heavy duty suspension option; those without were total slushboxes, not unlike most other American cars of the time. The Car and Driver staff may not have succeeded in their quest to match up the two legendary cars, but they did manage to put the magazine on the map. The issue was controversial and sales skyrocketed. The April 1984 "GTO vs. GTO" article paid homage to it's 20 year old predecessor, calling it "The hook on which we hung a magazine". It turns out the Pontiac GTO tested by car and driver was quite a ringer. It actually featured a Super Duty 421 featuring 370 hp and was breathed on quite heavily by Royal Pontiac, a noted Pontiac GTO tuner with connections to the Pontiac engineering staff. Since the 421 is visually identical to the 389, the fix was believeable. For more info, visit http://www.contes.com/ccvmore.htm and scroll to the bottom. Anyone disappointed that these two fine cars were not directly compared needed only a bit of patience. Twenty years later, the April 1984 issue again featured both cars on the cover and this time the Car and Driver staff pulled off the dream comparison. They were able to arrange use of both a Ferrari and a Pontiac GTO on a test track on the same day. The supporting cast included American driving icon Dan Gurney and the Laguna Seca racetrack; both names dear to the hearts of car enthusists. 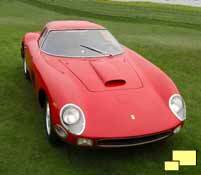 The Ferrari involved was s/n 5575 GT, the last 250 GTO built. The Pontiac was optioned for competition, lacking power brakes and steering, but including the tri-power engine and four speed transmission. Unlike the 1964 article, this time most of the praise went towards the Ferrari. It was no contest in the looks department; "Alongside the kill-for-me-red Ferrari, the pewter Pontiac looks like the box it came in". 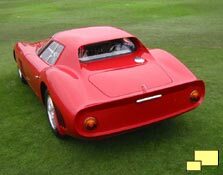 As predicted in the 1964 article, the Ferrari beat the Pontiac on the road coarse. It wasn't even close; average speed for the Pontiac was 77.7 mph vs. 84.9 mph for the Ferrari. Unlike the 1964 prediction, the Italian also won the drag strip contest. It achieved 60 mph in 5.8 seconds (vs. 6.9 for the Pontiac) and covered the 1/4 mile in 14.4 seconds. It took the Pontiac 15.1 seconds. Sharp eyed readers might note that the 1964 article had the Pontiac reaching 60 mph in 4.6 seconds, much faster than the Ferrari. Part of the discrepency can be attributed to the fact that the car tested in 1964 was breathed on by noted GTO tuner Royal Pontiac. The 1984 Pontiac also was tired, with 80,000 miles in its past and had problems getting full power to the ground. Both cars used 80s state of the art 70 series Michelin XWX radials for the test. Driver Dan Gurney did praise the Pontiac's hurst shifter but criticized the Ferrari gearchanging for being slow and long. Ferrari GTO s/n 5575 GT, the same car used in the 1984 Car and Driver Comparison.